The greatest play in Super Bowl history? With a re-match looming this Super Sunday, NFL Network showed a replay of Super Bowl XLII Monday night. It was one of my favorite Super Bowls, I have good memories of watching the game in my freshman year dorm at UW-Madison. The story lines were great: The Patriots going for the first 19-0 season in NFL History, Tom Brady going for his fourth ring. I love upsets, and have always disliked the Belichick era Patriots. So really, it doesn’t get better than Super Bowl XLII (Well, I guess my Bears could have been the ones to pull off the monster upset). I thought I’d offer some observations and recap one of the most exciting fourth quarters in Super Bowl history. The Patriots led 7-3 entering the final quarter. 15:00 – One of the greatest fourth quarters in NFL history started off with one of football’s most boring plays, a punt into the end zone for a touchback. The punt returner for the 2007 Giants? None other than former Bears great player R.W. McQuarters. 14:52 – After coming back from commercial, FOX panned to some of the celebrities in attendance at the big game: LL Cool J, Kate Hudson, Kurt Russell, Jordin Sparks, Peyton Manning and Frank Caliendo. In regards to the last “celebrity” shown, Joe Buck said he “has the ability to freak out his kids every morning by waking them up with a different voice.” Not true, even Frank Caliendo’s kids don’t think their dad has any talent. The Giants entered the fourth quarter having not scored since their first drive of the game. On the team’s first offensive snap of the fourth quarter, Eli Manning hit Kevin Boss for a 45 yard gain. Boss ran past Adalius Thomas and Rodney Harrison for the longest play from scrimmage in Super Bowl XLII. 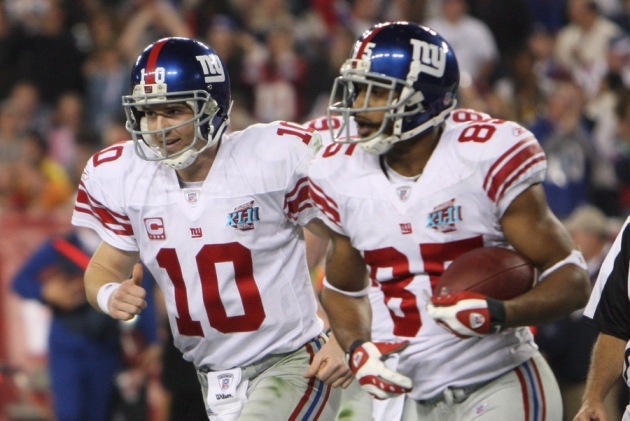 11:05 – Five plays later, Manning connected with David Tyree for the Giants’ first touchdown of the game and New York took a 10-7 lead. Asante Samuel was late getting over to cover Tyree, and Manning slipped a pass into the hands of Tyree. It would not be the last time Samuel failed to make a play, nor would be the only time Tyree came up huge. Buck noted that the catch was Tyree’s first touchdown grab of the season, calling it “the biggest catch of his life.” Well, for about half an hour. 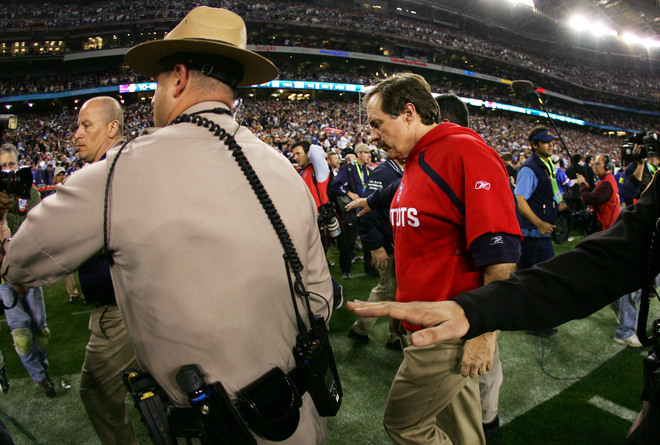 10:26 – After Wes Welker picks up a first down, FOX showed Bill Belichick, wearing a bright red hoodie, on the sideline. He definitely looks better in his signature hand-cut, short-sleeve gray hoodie. 9:30 – The Patriots were unable to immediately respond to the Giants touchdown. 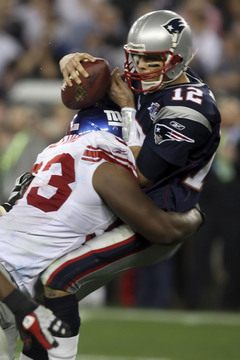 As was the story throughout the game, the Giants defensive line got great pressure on Tom Brady. Osi Umenyiora forced Brady into rushing a pass to a covered Welker on 3rd and 7, and the Pats were forced to punt after earning just one first down on the drive. 9:20 – The Giants got the ball at their own 20-yard-line up by three with 9:20 left in the fourth quarter. Obviously, New York had two goals, extend their lead and eat up as much clock as possible. However, neither happened for the G-Men. 8:32 – Eli Manning escaped pressure from Richard Seymour and Vince Wilfork, rolled left and overthrew a wide-open Plaxico Burress. It looked as if Burress slowed down while Manning expected the receiver to keep running. A completion would have gone for at least 25 yards, and maybe even a touchdown, as Troy Aikman hypothesized. 8:03 – Jeff Feagles punted it back to the Patriots. The Giants didn’t pick up a first down, and the drive lasted just 1:25. 5:27- After Brady hit Kevin Faulk for a four yard gain on first down, the FOX cameras panned to an obviously gassed Umenyiora on the sidelines. The Giants d-line had put forth an outstanding effort all game, but fatigue was understandably catching up with them. And it showed on the field, for the first time since the first quarter, Brady and the Pats marched down the field with ease. 5:01 – In the midst of a classic Tom Brady touchdown drive, Welker caught his 11th pass of the game, tying the record for most catches in the Super Bowl. It would be his last grab of the game. 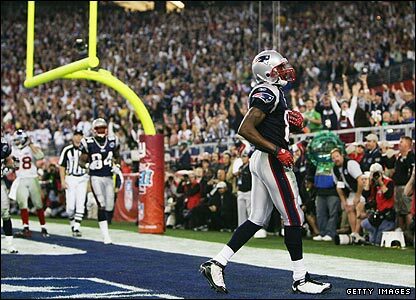 2:42 – On third and goal from the 7-yard-line, Brady hit a wide open Randy Moss in the end zone. Corey Webster, who otherwise had a great game, fell down on his one-on-one coverage of Moss. Brady completed 8 of his 11 passes for 71 yards and a touchdown on the drive. 2:09 – Eli threw a dangerous pass into double coverage to Burress that landed incomplete. It was the first in a series of ill advised passes Manning would make on his now famous fourth quarter drive. 2:04 – On the very next play, Manning threw a floater off his back foot into double coverage that was nearly picked off by Rodney Harrison. The replay zoomed in on Harrison, who was obviously pissed, knowing he was so close to all but sealing a perfect season for the Pats. 1:34 – On 4th and 1, Brandon Jacobs barely managed to get the first down, lunging to the New York 39-yard-line on his final effort. 1:28 – Manning just avoided getting stripped by Adalius Thomas after fleeing the pocket for a five yard run. 1:20 – This should have been the play that sealed a Patriots’ Super Bowl victory. Manning threw a pass, seemingly right into the hands of Samuel. Manning was angry, perhaps David Tyree, seconds away from Super Bowl immortality, ran the wrong route. After the play, Samuel put his hands on his head and screamed. The Lombardi Trophy slipped off his finger tips. Manning somehow escaped from the pocket. Thomas, Seymour and Jarvis Green all got their hands on Manning, with Green getting a hold of Manning’s jersey. Referee Mike Carey has said that he was maybe a second away from calling the play dead, saying Manning’s forward progress was stopped. Out of the pocket, Manning threw a pass into the middle of the defense. Four Patriots defenders were around Tyree, with Rodney Harrison being the closest, breathing down Tyree’s neck. Tyree and Harrison both leaped for the ball, and somehow, someway, Tyree secured the ball between his hands and helmet. As Tyree and Harrison fell to the ground, the ball remained glued to Tyree’s helmet, and miraculously, stayed mere inches off the turf. It was a completion for 32 yards, perhaps the greatest completion in NFL history. Again, luck was on Manning’s side. He should have been sacked. He should have been picked off. But he wasn’t, it was just Eli’s day. 0:51 – Again, Eli got away with a risky throw. Manning threw another pass into double coverage. Notorious head-hunter and current Bears scrub Brandon Merriweather attempted to make a Willie Mays style catch. It went off his finger tips into the hands of Tryee, who almost made another impossible catch. 0:45 – On 3rd and 11, Manning completed a pass to Steve Smith for a first down. Smith caught the ball a couple yards short of the marker, but scampered along the sideline for the first down. Burress burned Ellis Hobbs on a slant and go route, and Manning found him wide open in the end zone for the go ahead touchdown. FOX cut to Peyton Manning, who was clapping hard and screaming, showing more emotion than he ever did on a football field. Eli’s stats on the game-winning drive: 9-14, 152 yards, 2 touchdowns and all the luck in the world. 0:29 – The Patriots got the ball back at their own 21-yard line with all three of their timeouts remaining, needing just a field goal to tie. Brady had led drives that set up last second field goals in Super Bowls 36 and 38. Could he do it again? 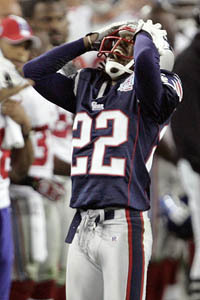 0:25 – On second and 10, Jay Alford charged through the middle of the Patriots offensive line and sacked Brady for a ten yard loss. If any one play captured the story of Super Bowl XLII, this was it. The Giants won the game because they harassed Brady like no team had ever done. 0:19 – Brady threw a pass about 75 yards down the field that went off the finger tips of Webster and Moss. It was a brilliant throw that was just inches away from being legendary. 0:10 – Brady threw another incomplete pass towards Moss on 4th and 20. The Giants got the ball. The Patriots are 18-1. 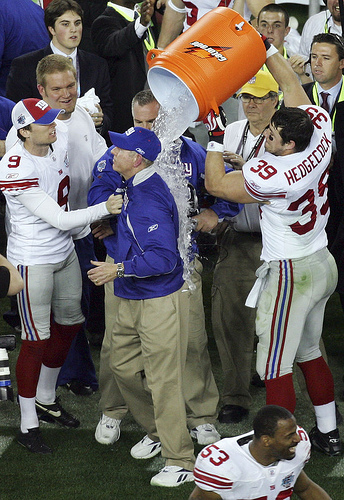 0:01 – The sidelines emptied, Coughlin got the ceremonial water bath, and the coaches met at midfield. However, there was still one second left on the clock. Everybody had to be cleared from the field and the Giants had to run one last play. It seemed pretty cruel to make the Patriots take the field for one last pointless play. Belichick and some Patriot players were already off the field before the clock read all zeroes.